Today's advertiser: Holly of ! I've been on the internet since 2001. I began selling part-time on eBay. I left a job about a year later to work with vintage full-time and started my site, . We just gave it a face-lift a couple of weeks ago and I'm really enjoying working on the new site. It's amazing what a new look can do for a gal! I had just quit a corporate sales management job. While sitting on my friend's porch one afternoon after a long season of temp jobs at area banks, I was bemoaning the boredom of working in the private sector. I cleared trades at the bank. "Holly, man…what are you doing?! What are you gonna do?" I wasn't sure what she was getting at, so I told her that I had saved some money and was thinking of traveling for awhile before I figured out how to re-enter the work force. I said, "I think I'm going to travel to Morocco. Wanna come with me?" True to Determinator form, she said "No. I mean what are you going to do with your life now? You seem totally bored and I'm getting sick of hearing about your temp job at the bank." I said, "Well…I suppose you're right. I might open a vintage store. I've been thinking about it for a long time, you know." That conversation got the ball rolling for me. I started selling on eBay a few months later and just as expected, the Determinator was right there helping me brand my company and cheering me on all the way! I was the national sales manager for a small-ish start-up company that grossed about 5 million the year I left. Then, I went into a tailspin with a series of seemingly dead-end temp jobs. Well, I have racks of things that I haven't offered yet. There have been a few items I've listed on eBay didn't sell and they still mystify me. Why, oh why doesn't anyone understand ? If you ask me, this is a winner and it will surprise me if someone doesn't want to snap this up quickly. Check out the print–don't you just love the lady in the shopping cart?! I deal a lot in what I'd call wearable, everyday fashions that are usually quite affordable. My vintage dreams (and they do actually wake me with a start) are about finding an estate where the woman was my size, had good taste in clothes, and maintained her wardrobe well. 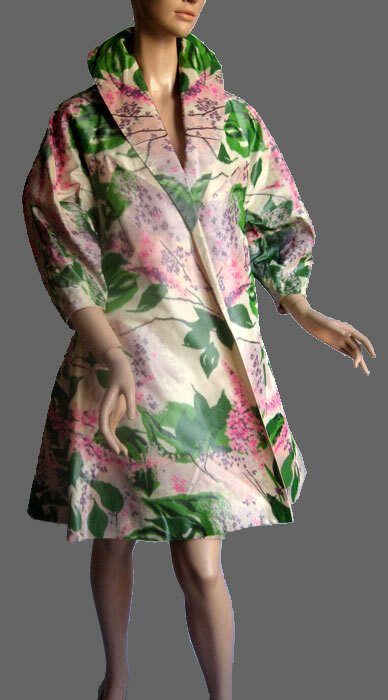 You can't imagine how many times I have found the ultimate 50s sun dress with a fabulous novelty print–in my size–only to wake and find I'm in bed and there's no sun dress! My wildest daydreamy kinds of fantasies always involve something I'm almost certain I won't find. My holy grails are vintage Adrian, Yves St. Laurent's Mondrian dress, a heavily embellished Nudie suit, and maybe a Charles James or a Fortuny just because I figure that if you're gonna dream, you might as well dream big. It's very pleasurable to research the history of fashion. It's most exciting to share my passion for history with someone else. When something that I sell lands in the hands of a person who'll treasure it (and probably even wear it), I'm always very pleased. You know, you start to feel like you're somehow an ambassador for these old things. I've always been attracted to that idea of merely being a host or a steward of vintage…like things are just visiting me for a little while and then I get to send it someplace else where they will be appreciated. It's sort of like being a connecting link in a big chain. I'd like to think that the things that leave lucitebox will eventually end up somewhere else in the distant future and that the chain just goes on and on. I have some of my grandmother's home-sewn clothes. I look forward to passing them on to the right person after I'm gone. When I look at one of the pieces, I almost feel her presence in the dress…as if she's right there sitting at her Singer in the sewing room working on it. Would you be interested in being featured in Vogue magazine next month? I can easily find one of my three or four tape measures! It's as if you put them down and they quickly end up wherever the one missing sock from the dryer goes! Ask for limited amounts of flash animation on any site. I'm sorry, I just don't have time to wait for your cool graphics to load. I would also put an end to the soundtracks that accompany sites. Please. Quiet sites, people. What you may not know is that even though I'm shopping and I really do want to read your blog or read about your merchandise, I already have my iTunes loaded and your music overlapping my music is creating a mind-bending mix that rivals any really, really bad acid trip. Hello, Advil Liquid Gels! Oh, and somewhat unrelated to interior design, but seriously entertaining–I just found a blog called that I LOVE! There are the people I want to party with! My longest running dream in life is to own a goat farm and make artisanal cheeses. But, tomorrow, I'll probably have a new one to replace that dream. At the moment, it seems that it might involve auditioning for So You Think You Can Dance! Holly is also offering a discount for Dress a Day readers. Please take 15% off of any item on lucitebox.com. Use the coupon code "erinisawesome" [Editor's note: I did not ask for this code!] HURRY! The sale ends on July 26th! 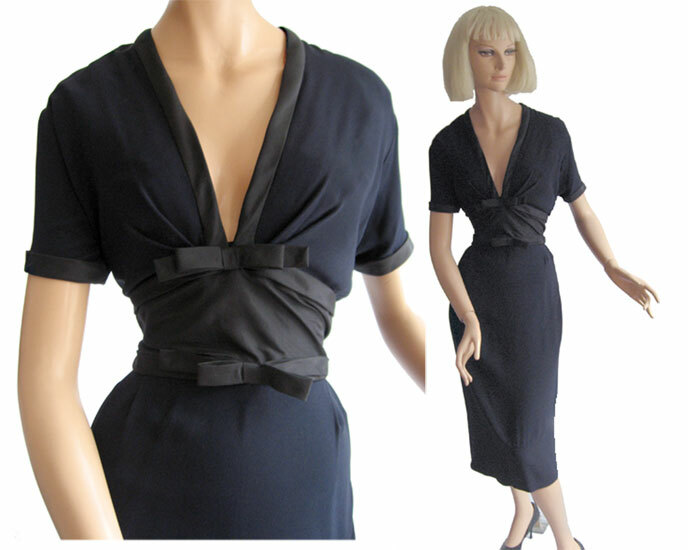 Some of the best vintage clothes in my closet are from Lucitebox. Holly knows clothes and she is great at identifying her regular customer’s individual sense of style. She has never failed to point me in the right direction — whether it was toward a dress on her site or offerred by another vintage dealer. Holly-I would totally buy that novelty jacket and dress if it was my size! I’ve looked at it half a dozen times, wondering if I could take it in. Thanks for sharing your beautiful pieces with the world. “Sewist” is such a weird word. Is it even real? I guess it’s because ‘sewer’ looks unfortunate written down. Personally I go for the not-terribly-gender-neutral ‘seamstress’. Hi there! I just got back from my day of dog walking (my other job) and have been alerted that the coupon code didn’t work despite lots of testing. OH NOES! **We have it fixed now**, so if you attempted to use it and couldn’t, it should be “good to go,” as they say. (I don’t know why, but I really don’t like that phrase at all. )Nadine–I like the word sewist. I think I learned it here, in fact. Of course, seamstress is a lot less weird sounding. I just wouldn’t want to leave out the boys that might apply. *wink*Pam & Anon 12:14–I know just what you mean. It’s such a drag to like something you see and then know that it’s not going to fit. If more things I loved were my size, I’d probably never sell anything and be more broke than a hobo at the side of the train tracks. Annemarie–thanks for the kind compliments! I’m so glad you enjoy my picks for you. I feel so fortunate to have gotten to know you and it makes me feel really great when I can nail-it-on-the-head and find just the right thing that suits your sensibility. I just wanted to let you know that I adore your blog and your advertisers are amazing. Do you have any plans to write any more Secret Lives of Dresses? They are so beautiful. that evening jacket is to die for! Hey Holly, thanks for the shout out. You can party down with us any time (if you make it over to Seattle)! Snap! Those dreams where all my vintage dreams come true are the best. Last night I found boxes and boxes of 1950s fabric…sigh…And good on you for being so brave to start your own shop! Oh my, just dropped by after a while away and I have to say “Thank you Erin” for posting David Tennant in a kilt. Cheered me up no end.I’ll go and actually read all the entries I have missed now.Skips off humming the Dr. Who theme.oooh eee oooo…. I just starting blogging and I’m so happy I found your blog. I just started sewing myself so I’ve been looking for cool patterns. Do you have a favorite brand of patterns that you make from? Or one that has the most patterns for more vintage looking dresses? Oh. My. Gawd. Those things are just GORGEOUS! Holly, I want to party with YOU! I’ll go check your site out later, enjoyed your interview with Erin. 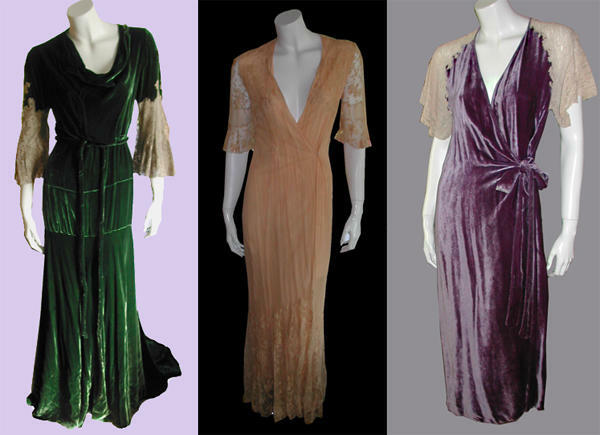 those 30s gowns are gorgeous! are there websites anyone would recommend to find more like them?